The Minister-President reminded an audience of real estate professionals and representatives of public institutions that this strategic area is one of the priorities of the Brussels government’s regional development policy. 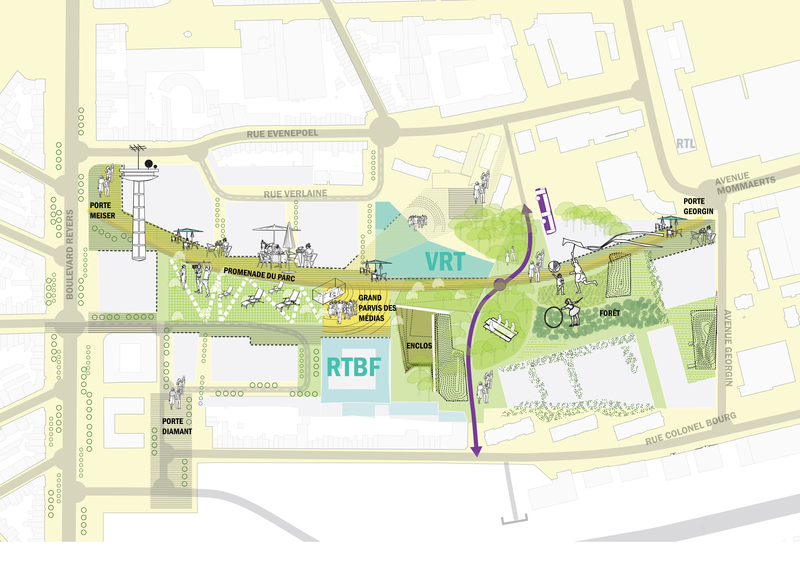 In partnership with VRT, RTBF and the municipality of Schaerbeek, the Brussels Region plans to transform this part of the city into a new metropolitan district, open up to the public the large park which lies hidden at the heart of the television broadcasters’ campus and develop a cluster of media businesses around the RTBF-VRT site. the plans for a west-east promenade as a structural component, running past the liveliest building fronts in the mediapark, and linking the more isolated districts to the east with the new park and Boulevard Reyers. The proposed new housing developments will be located around a new eight-hectare urban park (more info), served by major urban arteries which have been redesigned for efficient, calmer mobility (more info). They will offer local people numerous housing opportunities, a reinforced network of shopping and services and a vibrant city life, in contact with the creative businesses, colleges of higher education and cultural facilities that make up the media cluster. At Realty, the Minister-President again welcomed the decision taken by RTBF and VRT in 2012 to rebuild their headquarters at the heart of the district and their current site. Jean-François Raskin (Chairman of the Board of Directors of RTBF) and Paul Lembrechts (CEO of VRT) presented the architectural designs selected for their headquarters. The architectural work has been entrusted to MDW / V+ for RTBF and Robbrecht & Daem / Dierendonckblancke for VRT. More info. In addition, Jean-François Raskin, who is also Director-General of the Institute for Higher Social Communication Studies (IHECS), took the opportunity to announce that IHECS is interested in occupying premises on the mediapark.brussels site. The next steps are the approval by the Brussels government of the final site master plan following an impact assessment and a public inquiry (scheduled for the first quarter of 2017). Once these important administrative steps have been taken, the first mixed blocks of buildings can be developed.